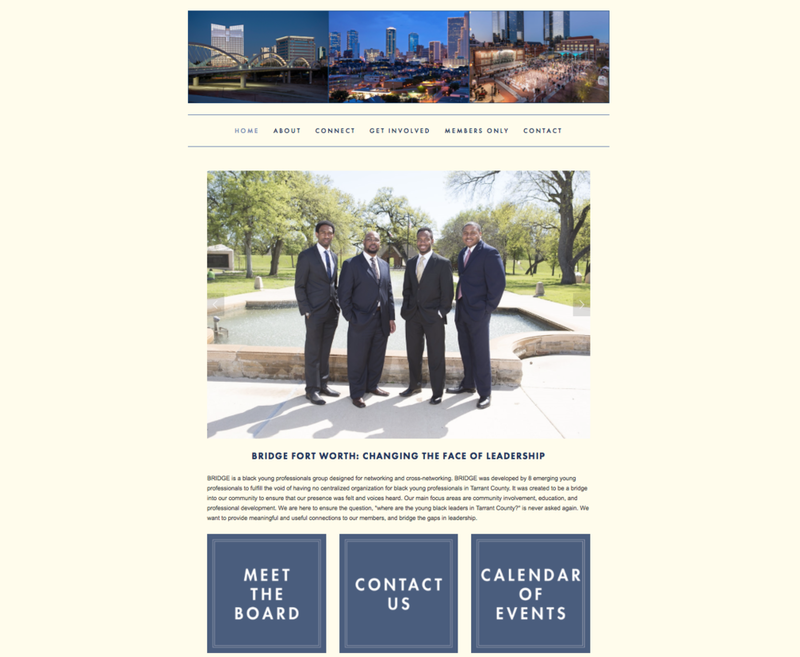 We designed a website for BRIDGE Fort Worth a few years back and the board has been doing a stellar job operating the site independently ever since! BRIDGE is an organization for young black professionals in the Fort Worth area, focused on community involvement, education, and professional development. Green Apple Lane proudly supports diversity and inclusion and it is our hope that leadership positions in every type of organization continue to become more reflective of the communities they serve, and the population as a whole. We were more than happy to create a site that better served BRIDGE's needs. The board wanted to have an online home for the organization to showcase event photos (with easy access to update with new photos and self-created event graphics often), promote upcoming events and professional opportunities, as well as the capability to sell memberships online, and the ability to host separate content for different membership levels, accessible by only members of that level. We were excited to jump in and find a solution to these challenges. As part of the design process, we also created some graphics to break up large text areas and to organize their information most efficiently, like the graphic shown above reflecting the difference in benefits between their two membership levels. BRIDGE has been very happy with the functionality of the site – they were able to take the reins and they've done a fantastic job ever since! Most folks are familiar with the historic Junior League organization, one of the oldest women's clubs in the country (active since 1901)! The 2017-2018 President of the Junior League of Arlington, April Pettitt, approached us prior to officially taking office to help develop a look for her theme for the year, "Heart is Key." We were proud to create a logo for JLA, and we love seeing it pop up continually on everything from social media graphics to members' T-shirts on the field at Dallas Cowboys stadium. These ladies are doing a ton of good in our community! For the logo, we created a key graphic with a heart bow, and if you look closely, you'll notice the key cuts are edges of a heart, alternating between the point and the curved edge. Thanks for all you do, ladies!